To get the top, you need to challenge the best. Nobody just showed up on day one as a legend. They worked. They toiled. They grinded and the gained the checkered flag over, and over, and over again. Such is the path to greatness. With the Alpinestars Challenger v2 Race Suit, that is exactly the kind of first step into the world of motorcycle racing that you can take. As one of the most widely known names in motorcycle gear Alpinestars has a plethora of experience at every level of life on two wheels, and for the Challenger v2 they put it all to use. 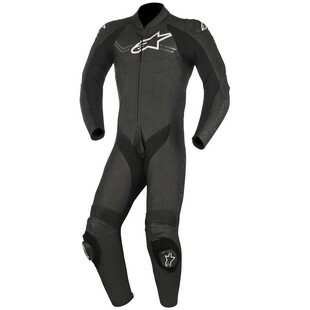 From lessons learned at the highest levels of motorcycle racing, Astars packed a ton of features and functionality into a leather race suit that comes in at an entry-level price point. In looking at the Alpinestars Challenger v2, everything from the premium 1.3mm leather outer shell to the CE certified internal protection at the shoulders and elbows has been crafted in a way to provide the levels of protection that riders need at the track. Additionally, the mesh liner, strategically placed stretch panels, and 3D multi-panel knee construction are just a few ways that this motorcycle race suit aims to keep riders comfortable throughout. Going to the track certainly ain’t cheap. It’s an investment in both time, and money. While Astars can’t do much about shrinking the time that it takes to get great, what they provide with the Challenger v2 suit is a way to mitigate the latter investment by providing a quality option at a fraction of the price of many of its contemporaries.